Helms Alee hit the stage, and brought forth a multi-faceted set that went through several variations over the course of its 45-minute duration, transitioning from mellow to violent and melodic to crushing and everything in between, the vocal harmonies being the standout feature of the band’s musicianship. This trio from the Pacific North West has earned themselves quite the fan base in the LA area owing to fine performances on past tours, and their fans were here in good numbers at this show. 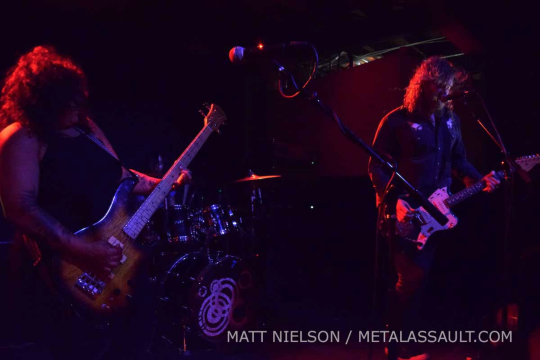 Choosing to play in minimal stage lighting, Helms Lee allowed their sound to be the primary focus for the audience, and delivered a set that was just the perfect companion and complement to what Mutoid Man followed with. Anyone attending these shows is getting treated to long sets by two very disparate bands, and the impact Mutoid Man makes can be attributed in part to the tone set by Helms Alee. Full article via Metal Assualt.